James Lerager has been photographing and documenting nuclear sites since the 1980s. His work has been widely exhibited and published. He is the photographer/author of the book "In the Shadow of the Cloud: Photographs & Histories of America's Atomic Veterans" and several monographs. James Lerager's forthcoming book -- a global perspective on the human and environmental consequences of the nuclear age -- is currently in preparation. When San Onofre's nuclear plant closed last summer, many breathed a sigh of relief. Yet San Onofre still requires a multi-decade "decommissioning,"' with radioactive fuel and components carted away to uncertain disposal, at further expense measured in hundreds of millions of dollars. Who profits and who pays is in dispute. When the Chernobyl reactor exploded on April 26, 1986, the Soviet government initially kept it secret. Some 600,000 workers and soldiers were ordered to build the now crumbling Sarcophagus. Estimates of excess Chernobyl cancers range into the 100s of thousands, and the region will remain contaminated for 100s of years. When the Fukushima nuclear power plant was overwhelmed by the earthquake and tsunami of March 11, 2011, three reactors melted down and Japan's Prime Minister considered ordering the evacuation of Tokyo, which could have displaced tens of millions of people. Some 400 commercial nuclear power reactors are operational around the world, 100 of them in the United States. The true costs of the nuclear era are largely unknown and generally suppressed. The unanswered question is whether or not we will continue to allow our leaders to drag us along a path toward a permanent nuclear dependency, with all its uncertainty and risks. Jun Hori is a noted Japanese television journalist and commentator. 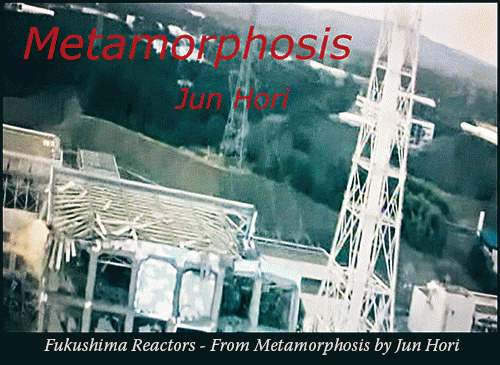 His documentary video "Metamorphosis" explores the Japanese citizen reaction to the Fukushima reactor meltdowns, and public opposition to government proposals to reopen Japan's remaining 50 reactors. "Metamorphosis" also explores several nuclear accident sites in the United States, including Three Mile Island. When NHK, Japan's public television network, refused to broadcast "Metamorphosis," Jun Hori ended his long-term relationship with NHK. Kei Kobayashi has undertaken an extensive photographic series of de-populated landscapes of the Fukushima region since the tsunami and nuclear meltdowns. His titles provide the location where the photographs were taken and include the ambient radiation reading at the time of exposure. Kei's work has been exhibited widely in Japan. 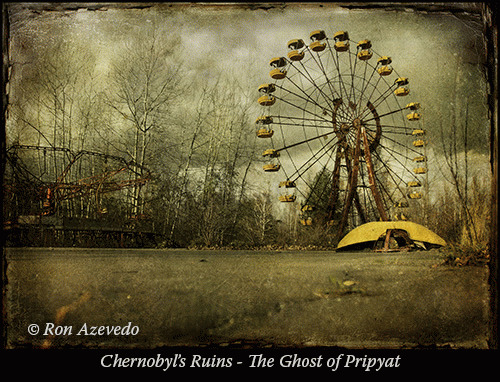 Ron Azevedo toured the Chernobyl region in 2012. His "Shadow of Chernobyl" series of photographs present a ghostly portrayal of abandoned areas that are slowly rotting away without human presence. For him, the trip was like walking through the set of a horror movie, exposing evidence of how "the actions of a few have the potential to create widespread ruin for so many."